Rare opportunity to purchase unique property in Stromness substantially below Home Report valuation. 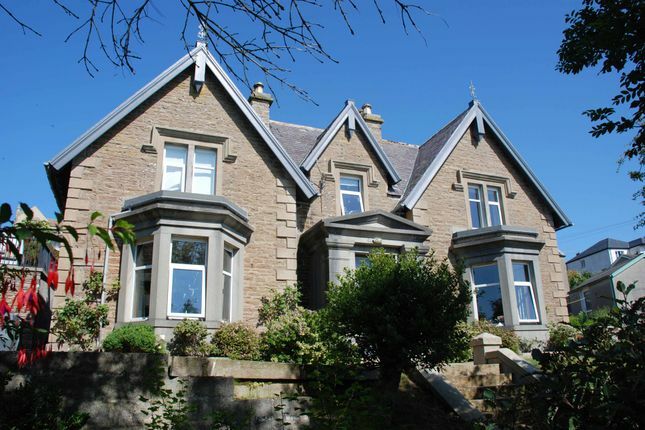 The ground floor comprises open plan kitchen dining area, utility room, pantry, bathroom, large hallway, sittingroom with open fire, second reception room and office; the sittingroom and reception room each have large bay windows overlooking the garden. The grand staircase has decorative wrought iron balustrades and a stained glass window. On the second floor are the 4 bedrooms, the master of which has an en-suite shower room and dressing room. The east facing bedrooms enjoy views over the harbour and Stromness Holms. Outside, the flagstone patio area is well presented and sheltered; the mature garden contains many trees and shrubs and a raised vegetable patch. A newly built tarmac car park off Back Road provides parking for at least 2 cars, in addition to the garage which lies separately. Within minutes walking distance from the town centre and all local amenities including both the Primary and Secondary schools. Oil fired central heating throughout. EPC Band E (40). Viewing highly recommended.